The White Elephant cinema opened in 1927, and was designed by architect H. Barnes for eccentric Glasgow cinema magnate AE Pickard. In its original configuration, it had seating for around 1900, part of a complex also featuring a ballroom, restaurant and car park. The auditorium was entered from beneath the proscenium, rather than from the rear as was more normal. The unusual name was the result of a competition, and was changed to just Elephant when the cinema was sold to AB King in 1934. A CinemaScope screen was installed in the 1950s. 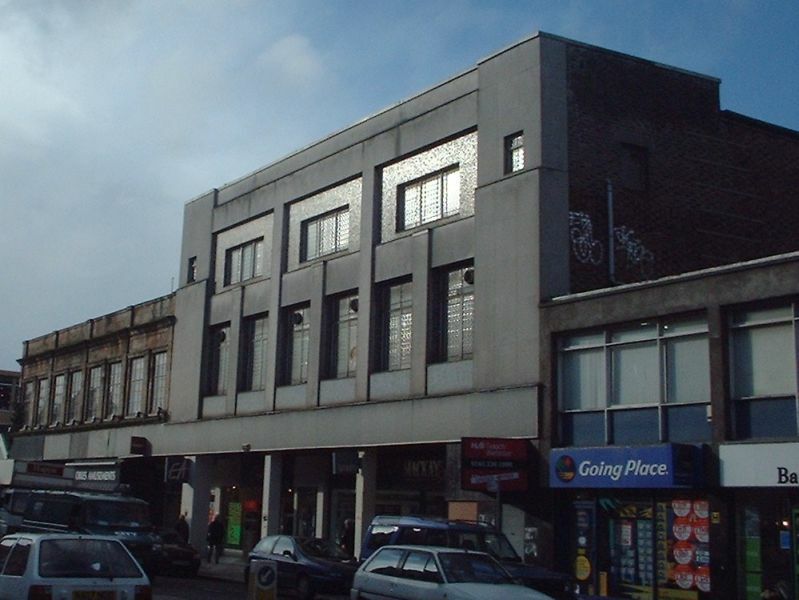 When it was converted to shops after closure in 1960, the facade was refaced and slightly cut down - the stonework finish was originally similar to the ballroom section (now a club) visible on the far left of the photo above. The entrance to the car park is under this section as well. A picture of the exterior of the auditorium block can be found here. A view of the interior as a cinema is here, courtesy of the Cinema Theatre Association archive. 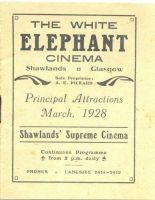 Click on the booklet on the left to see the full contents, describing some of the films that were showing in Shawlands' Supreme Cinema in March 1928. 100 Years of Glasgow's Glorious Cinemas, Bruce Peter, Polygon, 1996. The Glasgow Story website page on the cinema, with an photo of the original exterior, can be found here.